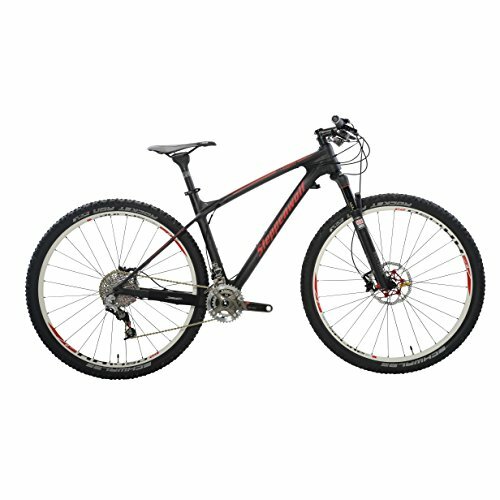 A hardtail bike is a great way to get into mountain biking. They’re fun bikes that can handle a variety of different terrains. A hardtail bike means that you’ll have suspension in your front wheel but not in your back wheel. Most of the shock in the bike goes through the front wheel, so that’s where it matters most anyway. Alternatively, you can try full suspension mountain bikes. Hardtail mountain bikes also have a very high level of pedaling efficiency because there’s much less movement in the back wheel. This can make them faster, and more fun to ride. They can also be suited to hybrid uses since the lack of rear suspension means that they can easily and effectively ride on tarmac. They’re great for trail riding, and depending on the level of suspension in the fork, can handle some pretty challenging trails too. In this article, we’ve reviewed some of our favorite hardtail mountain bikes. For each one, we’ve told you what it is we like about them and emphasized their strongest features. We’ve tried to give you as much information as possible so that you can make an informed decision when purchasing. 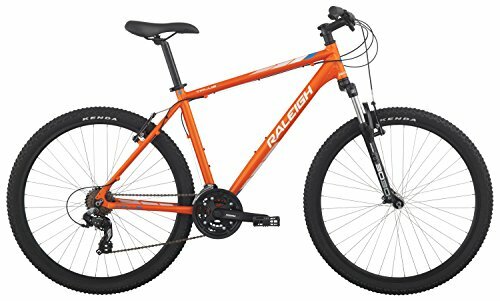 This is a great option for an entry-level rider. 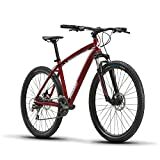 It comes with a lightweight aluminum frame that means it’ll handle quickly, and it’ll give you plenty of climbing potential for those hills. The wheels are 27.5″ which is a nice compromise between speed and handling capacity. It would suit light-trail and crossover usage. The mountain tires are 2″ thick which means they’ll roll fast and give you a high potential for speed. The bike features V-brakes at the front and rear which are easier to maintain and keeps the overall weight of the bike down. The frame geometry encourages a very upright sitting position, giving you good handling and making the bike very comfortable for long rides. Why We Like It – If you’re looking for a bike that can get you around the city but also be comfortable in off-road situations, then this is a great option. It’ll offer you high levels and speed and handling across a variety of terrains. With this bike, things are starting to get more serious. This Diamondback has a low-slung frame geometry that is long in the front and short at the back. This gives you a great level of maneuverability when trail riding but also excellent balance and stability. It’s made with a lightweight aluminum frame which means that the bike isn’t at all too heavy. The front shock has an impressive 120mm travel, meaning the bike suits downhill descents well. The wheels, at 27.5″ add to the maneuverability of the frame, without compromising too much on the speed. At both the front and the rear, there are Tektro Aries mechanical disc brakes, guaranteeing you excellent stopping power, whatever the conditions. 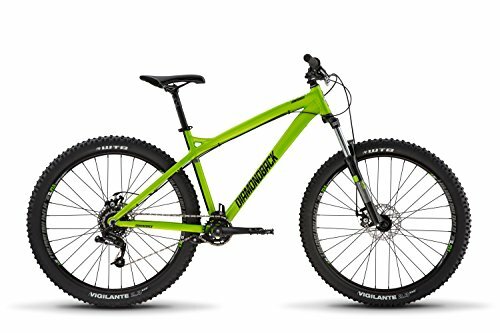 Why We Like It – This is an extremely versatile hardtail bike that’ll suit all sort of mountain biking trails and courses. It’ll give you plenty of control and definitely won’t hold you back. What we’re looking at here is a series of mid to high-level hardtail mountain bikes. They’ve got some very impressive components and features that make these bikes extremely fun to ride. The standout component is the carbon composite frame. It drastically reduces the weight of the bike and makes for a quicker, easier ride. Depending on the model you choose you’ll be looking at a bike that weighs around 25 pounds, which is extremely impressive. All the models feature a RockShox Reba RL fork with 100mm of travel. In the race models, the fork can be remotely locked to make for easier climbing. All models are fitted with Avid Elixir 3 brakes which offer great stopping power without adding too much weight. 29″ wheels are standard which will give you quicker flat-rolling and greater stability. The more you want to pay, the more features you’ll get and the lighter weight your bike will be. 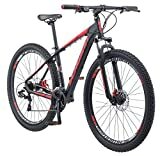 Why We Like It – If you want to take your mountain biking to the next level or you know you’ll be doing it a lot, this bike is an excellent choice. It’ll be an investment, but you’ll really see the difference in your performance. The carbon composite frame here usually comes with a much higher price tag. 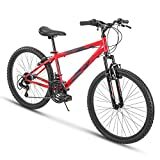 Check out these cheap mountain bikes for other alternatives. The Diamondback Line is basically the big brother to the Diamondback Hook. 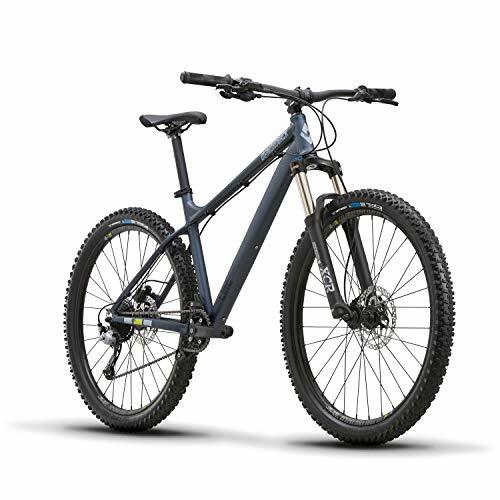 They have the same basic geometry, and their design idea is the same: a versatile all-rounder kind of mountain bike that will suit you well whatever the trail throws at you. The Line basically improves some of the components from the Hook. The 8-speed SRAM cogset is replaced by higher quality, 9-speed Shimano Acera M3000 Shadow. With this, you’ll be able to feel a slightly increased pedaling efficiency. The disc brakes are also improved, having been replaced with hydraulic Shimano models. Again, it just gives you a slightly higher level of the component. As with the Line, the frame is made from aluminum, and the fork offers 120mm of travel, allowing you to ride on a variety of rough terrains. Why We Like It – If you were interested in the versatility offered by the Diamondback Hook, but you have a few extra bucks to spare, the Line is well worth considering. The souped-up features just make it that bit better. The last offering from Diamondback is a slightly different flavor to the other two. It offers a different frame geometry that will have you sitting in a more upright position. This means it is slightly more tailored to cross-country racing than it is too technical trail riding. A big attraction of this bike is the 29″ wheels. 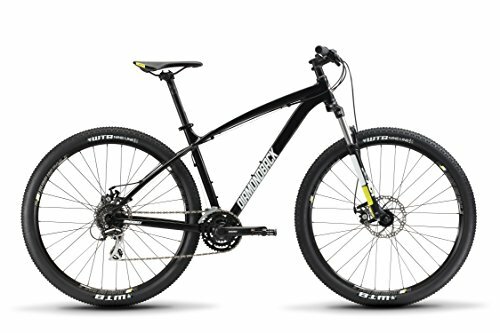 Larger wheels work well with a hardtail bike, particularly an endurance one because they compensate for a lack of back wheel suspension by making the track seem smoother. They also give great smooth-rolling efficiency and offer a lot of speed potential. The front fork offers 80mm of travel which will keep you from feeling every bump in the road. It has disc brakes front and rear and a 24-speed gear system. Why We Like It – If you’re looking for a cross-country ride that can get you across terrain quickly without breaking the bank account, this is a strong choice. It offers a very good level of capability at an affordable price. As you’ll see there’s a lot to choose from when it comes to hardtails. In this buyer’s guide, we’ve discussed some of the key features you should be looking out for when you’re making your decision about what bike to buy. A mountain bike frame needs to be sturdy but also lightweight. In the bikes we’ve surveyed you have two choices: aluminum or carbon composite. Aluminum is a great choice for a bike frame. It is the material that is predominantly used on airplanes because it is strong but still lightweight. It’s generally what you’d expect on a mid-range bike and will give you excellent performance capability. Carbon composite is an extremely impressive and expensive material. It is what is found on top-of-the-range bikes, and you should expect a price tag to match. It is very lightweight while also being very strong. You’ll feel the difference if you go for carbon composite, but it will set you back a fair bit. There are two basic kinds of hardtail bike: XC (cross country) or trail bike. With an XC, expect a frame geometry that’s more upright and probably a bit larger. They tend to be the models that exhibit larger wheels (29″) and have slightly less movement in the suspension. They’re suited to cross country riding, with more of an emphasis on speed and stability. They’re a comfortable ride and can be ridden over long distances without any trouble. Trail bikes are more suited to technical courses. They have a geometry that tends to be short at the back and long at the front. This offers superior handling. You’re unlikely to find 29″ wheels but the suspension will travel further, suited for the rockier technical trails. Connected to this is the sort of wheels you want. A bigger wheel will roll more easily and give you greater speed potential. If this sounds like what you’re looking for, purchase a bike with 29″ wheels. Smaller wheels, like 27.5″, will give you better handling and maneuverability, which makes them favorites of downhill riders. In terms of tires, the wider they are, the more grip you’re going to have. However, you will compromise on speed. 2″ width is standard for an XC bike, but you might want something thicker for a trail bike. Hardtail bikes can suit almost the full spectrum of mountain biking needs. The general consensus is that, with a hardtail bike, you usually get more bang for your buck. They’re the original mountain bikes and are great fun to ride. Before you make your purchase, think about what sort of tracks you want to use your bike on. If you’re planning on being a technical rider, a factor that into your decision. If it is cross country tracks that you want to ride on, you might want to pick a totally different model. In any case, all the bikes we’ve reviewed are nice and versatile and suit a range of terrains.